We are the only music group in the region with a full orchestra and choir! Formed over 50 years ago, we perform a variety of music and are just as happy performing music from shows and musicals as we are tackling bigger works, such as Carmina Burana, The Armed Man and Elijah. In 2015 we included Verdi’s Four Sacred Pieces, which we performed in a wonderful church in Ipswich. We welcome new members to our choir and orchestra. As a large organisation we gain new members and we lose some as well as they move on to other activities. Male and female voices are always in demand for the choir and if you are instrumentalists of grade 5 or above and would like to join us, please get in touch. Strings players are especially welcome and our Orchestra Secretary likes to keep in touch with a wide range of players in case we need something unusual for one of our performances! Rehearsals are held in Ipswich during school/university vacation periods on varying days during the week. 7:15pm – 9:45pm. We let our members know well in advance when and where these will be and details are available here on the website too. 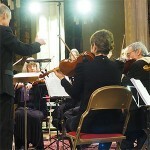 Our full choir and orchestra perform 3 concerts a year which take place in January, April and September. They are usually in Ipswich though we do sometimes perform at other venues too such as Snape Maltings. Small groups of members perform 4 community concerts each year which gives us the chance to share our music with local communities and raise valuable funds for local projects and causes. We are also involved in other events throughout the year such as Ipswich Music Day where some of our musicians and a small group from the choir perform. Trianon makes regular visits to see our partner music group in Arras, France and in 2015 we hosted a German choir, who performed 3 fantastic concerts in and around Ipswich during their stay. So there are great opportunities for socialising and music making with Trianon! Announcing the next piece – what’s so funny?